Located in the business and cultural center of Donetsk, the Hotel Central is well-known for the famous foreign architects who participated in the design and construction of the hotel. Along with such assistance in the design, the hotel management maintains a high level of service through help from the International Management Association of Hospitality Business. 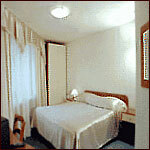 The hotel offers single and double rooms of standard class as well as business class suites. All rooms feature a bathroom with a shower, a telephone with long-distance calls of very high quality, satellite TV, minibar and hair dryer. 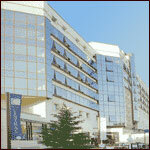 The hotel has a special car parking area with service center and underground garage. The cozy Leonardo Cafe and a summer cafe on the terrace of the hotel offer a wide choice of European dishes and beverages as well as our national home-style Ukrainian cuisine.